Trout and the Angels are finalizing a 12-year extension worth more than $430 million, Jeff Passan of ESPN.com reports. The deal will keep Trout in an Angels uniform for presumably the remainder of his career, as it contains no opt-outs, per Bill Shaikin of the Los Angeles Times. 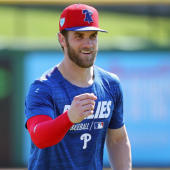 He'll top the record for highest average annual value (currently held by Zack Greinke at $34.4 million) and smash Bryce Harper's $330 million contract as the largest in baseball history. The reported contract includes the two years left on Trout's current deal, so the new money he'll wind up making amounts to 10 years and $360 million, Joel Sherman of the New York Post reports. The extension will close off the possibility for Trout to wind up in a more hitter-friendly park with a stronger lineup around him any time in the near future, though it's not as if his fantasy stock needs much of a boost.